We didn’t plan on renting a car in Costa Rica. It happened by accident actually. We had traveled to this Central American country a few years before and used local transport and shuttles to get around. So when we returned for a 2-week trip in Costa Rica, we planned to do use public transportation again. 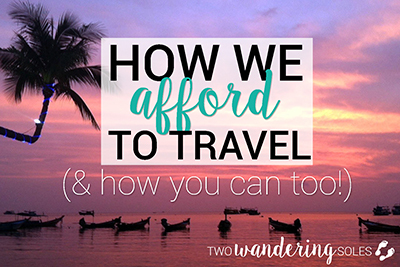 We were backpacking through Central America, after all, and our tight budget meant we just didn’t give any thought to renting a car. But that 1-day car rental quickly turned into 2 weeks after we realized how much more of the country we could see with our own vehicle. Plus, we were surprised how CHEAP it was to rent a car in Costa Rica: We paid just $20 USD per day for a small 4-wheel drive SUV. In true Ben & Katie fashion, we gave our tan little SUV a name: Eduardo for long, “Eddie” for short, and together with Eddie, we explored the country for 2 weeks. We were rewarded with epic views and hidden little restaurants that we never would have been able to explore otherwise. There are a handful of things we wish we would have known before renting a car in Costa Rica, so we’ve put together a complete guide with everything you need to know. This way you’ll be much more prepared than we were! We’re breaking down the exact cost of renting a car in Costa Rica, all the reasons it is a better option than taking the bus, plus our top tips to save you money and headaches. We saw pictures of the stunning Rio Celeste, and decided that a trip to this aquamarine waterfall needed to be on our Costa Rica itinerary. As it turns out, it would require a lengthy ride on a local bus. And due to the park hours and the bus schedule, we’d need to spend the night in a tiny town nearby, and then schedule a taxi ride to the park entrance the next morning. And that didn’t even include arranging transportation away. Our heads hurt. An alternative was hiring a driver, which would set us back a ridiculous amount of money for a round trip. So the only option that seemed even remotely feasible was renting a car. Well, it turns out renting a car in Costa Rica is very cheap, and driving in Costa Rica is actually quite easy, and dare I say… fun! After one day, we were hooked. Needless to say, our 1-day rental turned into more than 2 weeks. Is a rental car cheaper than the buses? Should I reserve my car rental online or in person? Is 4-wheel-drive necessary in Costa Rica? We’re so glad we made the decision to rent a car in Costa Rica, and we’re going to share why! We expected renting a car to be expensive, but as we found out, it is actually cheaper than taking the direct shuttles between popular destinations. Read below to see exactly how much we paid for our 2-week car rental in Costa Rica. Costa Rica is a very touristy country, and the only way to escape the crowds is to venture off the typical tourist trail. Usually these places can be difficult to get to if you don’t have your own vehicle. One of our highlights during our time in Costa Rica was spending some time at Rancho Mastatal, a sustainable community in the mountains. Getting there without our rental car would have been quite difficult, so we were really happy we had our own ride! Costa Rica’s countryside is epically beautiful. If you’re on a bus or a shuttle, you’ll have to take it all in as you whip around the curves and turns. But if you’re driving, you can pull over at any time (when it’s safe to stop!) and take the scenery in the way it’s meant to be enjoyed. See a pretty waterfall? Pull over! It’s that simple. Local buses are cheap, but oh so slow! They stop just about every half-mile to pick up people on the side of the road needing rides, and a short journey can take exponentially longer than you might think. But most of Costa Rica is pretty laidback when it comes to driving, and people were mostly courteous. Aside from driving through San Jose, we didn’t encounter much traffic or difficult situations. 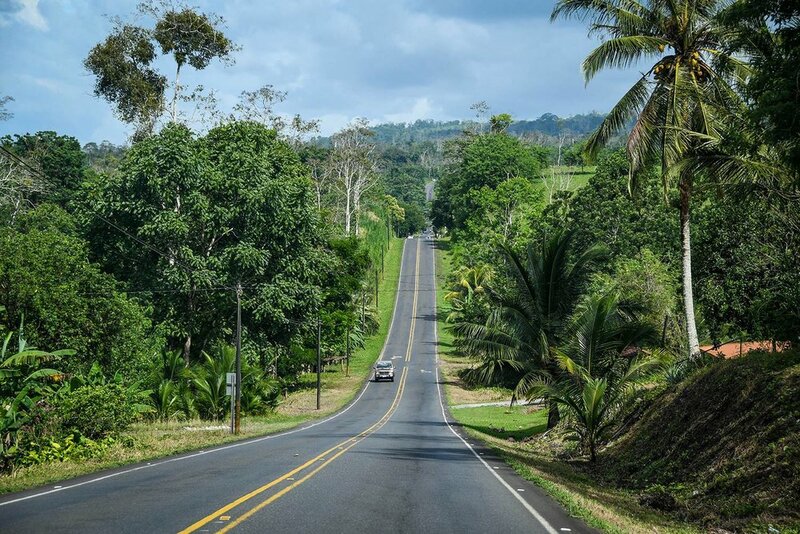 Keep reading for some tips that will help you drive safely in Costa Rica! If you have your own vehicle, you don’t need to look up bus times. You don’t have to wake up early to catch that 6am bus. You can stop whenever you need to, use the restroom or you get hungry. Turn on the AC or roll down your windows. It’s up to you! There just something about road trips that are so much fun! Stock up on snacks, crank some tunes and sing aloud, or listen to a podcast with your travel buddy. No headphones needed! We drove our rental car to 8 different locations around Costa Rica, and finding parking was never an issue. All our hostels, hotels and Airbnbs were equipped with parking spots. And the couple times we had to pay a parking fee at National Parks, it was cheap (between $2 - $4 USD for all day parking). Remember when we said during our first visit to Costa Rica we took only public transportation and shuttles? Well, one of the shuttle rides was a pretty awful experience. I (Katie) sometimes get carsick, and the winding country roads did a number on my stomach. But instead of being able to get out and walk around whenever we pleased, I was handed a plastic bag. I tried my best not to completely gross out everyone else in the shuttle. If you’re like me, having your own vehicle will allow you freedom to stop when you need. Plus, sitting in the front seat (or driving) helps prevent carsickness a ton. Pro Tip: Motion sickness wrist bands and ginger chews have helped me a lot! If you're only going to 1 or 2 destinations in Costa Rica, it might not be necessary to rent a car. This is especially true if you don't plan to do much exploring when you get to each location, as the car would just sit at your hotel during your stay. In this case, taking a shuttle or bus would be a good option for you. If you're nervous about driving in another country. Even though we felt driving in Costa Rica was quite easy compared to many other countries, it can still be a bit stressful driving in a foreign country. If this worries you, it might not be worth the stress of renting a car. If you're traveling solo and you're on a budget, renting a car would be an expense that might be hard to justify since taking a local bus (not shuttles) would be much cheaper. How much does renting a car in costa Rica cost? 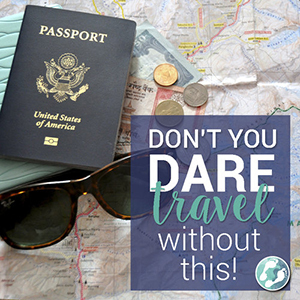 If you’ve been following our blog for a while, you know we try to travel on a budget, and we keep track of all our expenses. Before making the decision to rent a car, we calculated the cost and compared it to taking the bus or shuttles. It turned out that renting a car is actually a very affordable way to travel around Costa Rica. We paid roughly $20 USD per day for our 4x4 SUV. The price is going to vary depending on the type of vehicle you get, what time of year you are traveling, and which rental car company you go through. We rented a Daihatsu Bego, which is a small SUV with 4-wheel drive. We were traveling in June, which is shoulder season and has cheaper rates than peak tourist months. And we booked our vehicle using RentalCars.com to find the cheapest rate. In addition to the actual car rental, be sure to add in the cost of gas, which was roughly 680 CRC per liter ($4.53 USD per gallon) while we were there. And if you plan to drop off the car in a different location, you'll be charged a "drop off fee" (ours was about $50 USD). In total, our rental car, gas and drop-off fee came to exactly $540.43 for 15 days. Is a rental car cheaper than the buses in Costa Rica? The bus stopped every half-mile to pick up people from the side of the road. And what started out as a comfortable ride ended up being super cramped and stuffy, with people packed into the aisles. The journey took just over 6 hours, when a direct shuttle would have taken 4 hours. After this ride, we decided that for journeys longer than a few hours, the shuttle might be worth it. But saving all that time comes at a higher cost. For example, the 4-hour shuttle from San Jose to La Fortuna costs around $40 USD per person, and the 6-hour shuttle from Monteverde to Santa Teresa will cost you $55 USD per person. When we started tallying up these costs, we soon realized that shuttles would add up quickly. When we requested a rental car for 2 weeks, the cost broke down to just $20 per day. If you’re traveling with a partner, that’s just $10 per person each day. True, there might be days where the car sits and you don’t use it, but it is still quite a good deal. We found that it would be right around the same price – if not slightly cheaper – to rent a car rather than taking the shuttles. On top of that, we had the convenience of being able to come and go as we please, and get to off-the-beaten-path places we could never get to via a shuttle. You might think that visiting the rental car shop in person would give you the best deal, but you’re wrong! We thought that too, and just stopped into the Alamo store in La Fortuna. The friendly man behind the desk quoted us $69 USD for one day with a sedan (aka no 4-wheel-drive). We didn’t know what to expect, but thought that was a little steep, so we went back to our hotel and checked online. We went to RentalCars.com to compare all the car rental companies (kind of like what Kayak does for flights). It turned out that Alamo had the best deal, but it was WAY less than the man in the store had told us. That same car was a measly $12 USD a day (and there were even ones on there for as little as $7!). We ended up choosing a small SUV with 4-wheel drive and made our reservation for the next day, which came to $24. We thought it was too good to be true, but we showed up at Alamo the next morning, and the same friendly man greeted us and handed us our keys. When we drove off, it kind of felt like we were stealing the car, it was such a good deal! It was so convenient that we decided to rent for a few more days. We thought the man could just give us the same deal as we had gotten online, but when we showed up the next day, he apologized saying that you can only get that deal by booking online. He tried explaining that RentalCars.com must reserve a bunch of cars and Alamo earns money whether they are rented or not, which allows the booking platform to offer better deals. So we stood there, in the Alamo store, and made our reservation online. 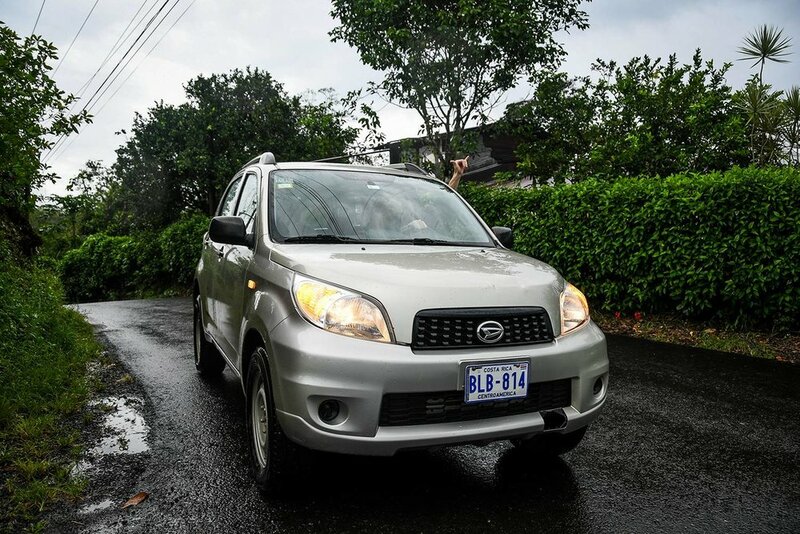 During our stay in Costa Rica, Alamo had the cheapest price for the type of car we wanted. Adobe is a popular rental car company in Costa Rica that is often recommended, but we found their prices to be more expensive for what we wanted. Also, they require you to get their insurance policy, while going through RentalCars.com allowed us to book a car without it. It is required by Costa Rican law to have insurance that covers rental cars, but in most cases your credit card or travel insurance will cover this, making it unnecessary to get insurance through the rental car company itself. More on this below! *Note: We were not paid by RentalCars.com to write this article (they likely don’t even know it exists!). Like we said, we tried to book in person, but the best deals by far were online. We browsed several websites (and encourage you to also!) but we found the best deals on RentalCars.com and are simply recommending them based off our personal experience. If you book through one of our links, we will make a small commission at no additional cost to you. International drivers license: You can purchase this before your travels at any AAA store. It costs $20 USD. $1500 hold on your credit card: This hold is to make sure you return the card and if you have any damages, the card will be charged. The amount of the hold varies depending on the companies you book with. In our experience we had a $1500 hold with RentalCars.com and Alamo, but we have read other places the hold could be up to $5000. Make sure you have a large enough credit limit on our account. Insurance that covers rental cars: Your credit card or travel insurance usually covers this! This is a great question; and the answer is yes, you absolutely should have insurance on your rental car. Accidents do happen and you don’t want to have to fork over thousands of dollars for any damage you may incur. Plus, having rental car coverage is actually required by Costa Rica law. The tricky thing is some rental car companies in Costa Rica include the national mandatory insurance in the price of the car and others do not. That’s why some people say they get tricked with hidden fees once they are in Costa Rica. For instance, your rental car might say $20 a day when you book online. But when you show up in person, they add a daily insurance rate that they say is “mandatory”. It can increase your rental car price quite a bit. But here’s the thing: You likely don’t need to buy the policy from the rental car company, because you are probably already covered by your credit card or your travel insurance. Most major credit cards actually include coverage on rental cars. Cool, I know! Check into your credit card’s policy to be sure. (We have Chase Sapphire Preferred and Capital One Venture cards, and both have rental car insurance). Additionally, your travel insurance might also cover rental cars. Read the policy’s fine print to check for yourself. If you need more information, we’ve got a complete guide to choosing the best travel insurance policy that should answer all your questions. If you are confused if your rental car company charges the mandatory insurance or not, you should call their customer service number to clear things up. This is how we personally declined the “mandatory government car rental insurance”: We showed up to the Alamo counter and showed them proof of our travel insurance and credit card coverage of rental cars. We also needed to approve a $1,500 hold on our credit card that was returned to us when we turned in our vehicle. *Rental car companies have differing rules when it comes to insurance. Our experience was with Alamo. We are unsure if you can decline this mandatory insurance policy if you book with Adobe. Is 4-wheel drive necessary in Costa Rica? Unless you're only planning to drive in and around San Jose or directly to the coast, we would highly suggest getting a 4x4 car. Many of the waterfalls and small towns we visited involved a steep climb on gravel roads. It might be possible to do without 4-wheel drive, but it gave us peace of mind knowing that we didn't need to worry about which roads we took. And when we looked around the parking lots in these places, it seemed like nearly every other car had 4-wheel drive too. You'll also want to think about the car's clearance. Our small SUV had decent clearance, but there were a few times we came close to scraping the bumper on potholes or uneven road. Had we rented a smaller car, we definitely would have come away with some dents and scratches. There are a few things we learned about driving in Costa Rica specifically. We are sharing our top tips with you because we wished we had known these things before driving out of the parking lot for the first time! 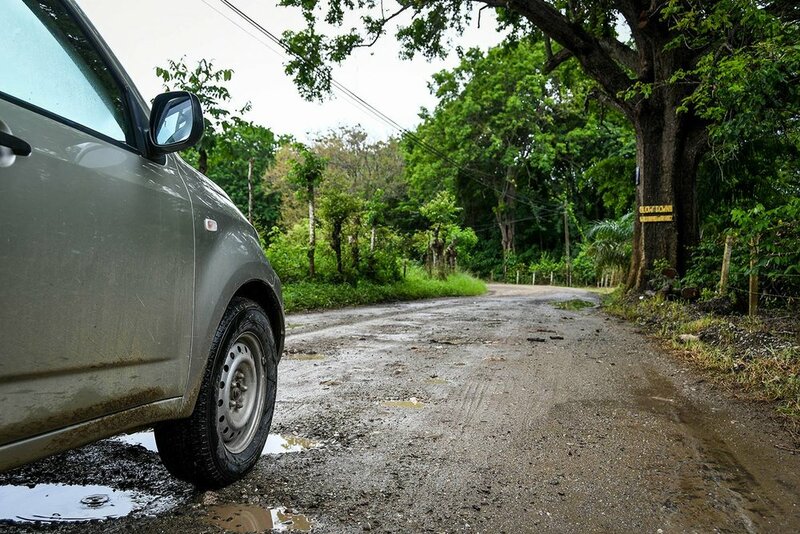 For being the wealthiest country in Central America, we were surprised by how many of the roads in the country are… how shall we say this… rough. Potholes are common, and they are BIG. And throughout the country, there are many unpaved roads, which can show signs of erosion, especially in the rainy season. Drive slowly on rough roads and try your best to avoid them. Be especially careful when crossing roads covered in water, since you may not know how deep it is or what’s below. While you have your eyes peeled for potholes, look out for speed bumps as well. They are most common when entering small towns or school zones. The speed bumps are not always marked with yellow paint like you’d expect, so sometimes they blend in with the road. Going full speed ahead over a bump is not fun. Take it from people who know from experience! We would highly recommend getting 4-wheel-drive in Costa Rica. If you’re staying in or around San Jose and are going only a short distance or on a route where you know the road is well-paved and relatively flat, you could probably get away without it. But with all the driving that we did, we were so happy we had 4-wheel drive. There were several places we visited that we would not have made it to without it. While driving in the countryside of Costa Rica, you’ll likely encounter many semi trucks delivering goods. Many of the countryside roads are narrow and winding, so be very cautious when coming around curves. Also, be very careful if you decide to pass a truck. Be sure you’re doing it in a safe zone and you can see the other lane. One-lane bridges are very common all throughout Costa Rica. Know the etiquette before you encounter them so you’re not wondering what to do like we were! Slow down when you’re approaching a one lane bridge. Typically (though sometimes this is not) there will one direction with a red and white triangle signs stating "Ceda el Paso" meaning "Yield". If you see the sign, be sure to yield. If you come to a one lane bridge and there is already traffic coming across, you must wait until the entire other side is finished and then you can pass over. If the cars going your direction are crossing the bridge, you simply follow along and continue crossing the bridge. If you and another car arrive at the bridge at the same time and there is no yield sign, be cautious, because the other driver may try to go first, like a "who ever gets there first" type of deal. Filling up is really easy in Costa Rica. All the gas stations we encountered were full service, meaning there is an attendent who pumps the gas for you. They will ask you regular or super and will start filling your tank. We always paid in cash, but I'm sure some gas stations near bigger cities could take credit card. Once you're all filled up, pay the attendent and you're on your way. When driving near San Jose, be prepared to pay some tolls. Most of them were pretty cheap (from 360 – 720 colones, which is $0.64 - $1.28), but you’ll want to have some coins on you to pay with. These tips are pretty universal whether you're renting a car in Costa Rica, Canada or Germany. We hope they are helpful to you as you plan your trip. Get up close and personal. Take photos on your cell phone of any scrapes and dents, no matter how small. And don’t forget any little cracks on the windshield. This way, none of these issues can be blamed on you. We’ve never had to use these photos, but it’s a good idea to have yourself covered just in case! Since the online booking platforms reserve several cars and pay the company whether or not someone actually rents them, they get a great rate and can pass the savings onto you. It is almost always cheaper to book online rather than walking into a store. Plus, you won't need to worry whether there will be availability if you book it ahead of time! When we did a 1-day rental, we paid $24. But when we decided to rent for 2 weeks, it broke down to just $20 per day. Had we rented the car for longer, it would have been even cheaper. This is one of our all-time favorite travel apps! It’s free (so why wait?!) and it allows you to download a map of an entire country or region. Like Google Maps, Maps.Me will display your GPS location so you’ll always know where you are. But unlike Google Maps, after a map is downloaded you will always be able to see the roads, restaurants and attractions, even if you don’t have cell service! This is super convenient when you’re on country roads and don’t have cell service! 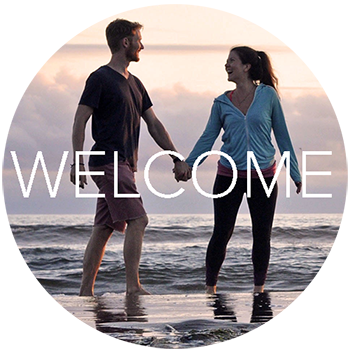 Do you have any more questions about renting a car in Costa Rica? Comment below and we’ll do our best to answer your question! *This post contains affiliate links, which means we earn a small commission if you decide to book a car via RentalCars.com. This doesn’t cost you anything extra, and it allows us to keep producing great content for you! Thank you in advance for your support.